Since the election, telecom and media stocks have surged, while the big internet names have languished. We expect those trends to reverse a bit with 4Q16 earnings. AMZN looks poised to beat expectations for top-line deceleration, as brick-and-mortar rivals keep pre-announcing despite surveys showing strong consumer Holiday spending. We also expect good numbers from digital ad driven names GOOGL, FB and even TWTR, against similar forecasts for deceleration. Recent news of big contract wins for WDAY reflects real momentum for best-of-bread SaaS that ought to show in other names as well. We also expect robust hyperscale datacenter capex to yield upside for component names like NVDA, XLNX, and MLNX. Meanwhile, we disagree with consensus projections of sales acceleration for most media names, and we expect the dynamic of TMUS harvesting share from VZ and T to have continued unabated. NFLX blows out on subs. NFLX reported after the close earlier today and delivered 7M new subs, far outpacing expectations of 5M. The virtuous cycle of subscriber growth enabling the acquisition of new original content driving faster sub growth is defying expectations of inevitable deceleration. Subs should top 100M before mid-year as the company executes on its international expansion strategy. While NFLX will remain in investment mode, particularly adding exclusive non-English content to further its global manifest destiny, the rapid growth suggests margin expansion and cash flow sooner rather than later. Despite the lofty P/E, we see further upside for the stock on major upward revisions. AMZN wins Christmas. With TGT, M, KSS, JCP and JWN all pre-announcing for 4Q16 despite rosy overall consumer holiday spending estimates, it seems obvious that AMZN likely picked up most of the upside this season. Despite that, analysts expect 4Q16 sales growth to decelerate from the first three quarters of 2016 despite a fairly easy YoY compare. We look for a sizeable top-line beat, although, as usual, expense levels are anyone’s guess. Digital ad upside. Analysts expect sharp deceleration from GOOGL, FB and TWTR. Given signs of momentum for digital ad spending, we see potential for significant beats. At the same time, we are skeptical about projections for accelerating sales at FOXA, TWX, VIA.B, and DISC.A in an environment of disappointing audience trends and anxious advertisers. SaaS keeps up the momentum. A week ago, news of big contract wins for WDAY drove that stock higher and added a tailwind for compatriots like CRM, NOW, and ADBE. We expect the good news to play through earnings, as consensus still expects growth to slow for most of the group. The street is more optimistic for MSFT, but we believe that continued 100%+ growth for Azure and upside from PCs against an easy compare make it a likely beat as well. We are less bullish than the street for most other traditional software names. ORCL just reported weak numbers and expectations for 10.4% growth from SAP are aggressive. DoJ hits QCOM with time running out. In a 2-1 partisan decision, the Obama FTC accused QCOM of antitrust violations. We do not expect these charges to hold. Not only is it likely that the Trump DoJ will pass on taking the investigation forward, but we believe it unlikely that the evidence would support a negative outcome anyway. QCOM management has been well aware of the dictates of US anti-trust law since it began its licensing program 25 years, and has been unequivocal that its negotiating practices have remained far from the grey zone of legality. Meanwhile, there are signs that better royalty collections and chip share gains may have driven 1QFY17 results ahead of consensus. Same old same old in telecom. Expect tough wireless sub numbers and tightening ARPUs from T and VZ, as S and especially, TMUS continued to claw away at their core wireless business from below. PayTV and residential broadband may also suffer from overall market erosion and share loss to cable. 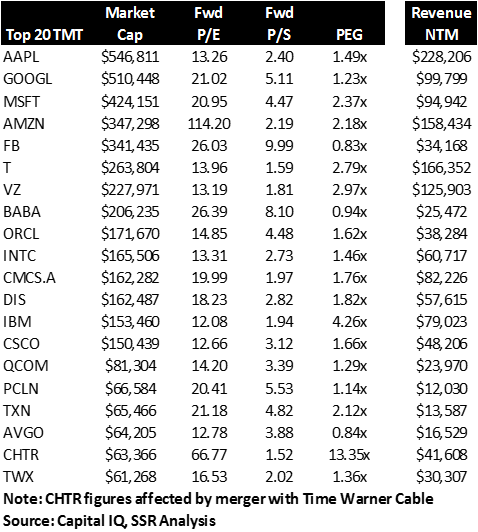 We continue to see TMUS as the big winner in the group, and project another quarterly upside surprise. 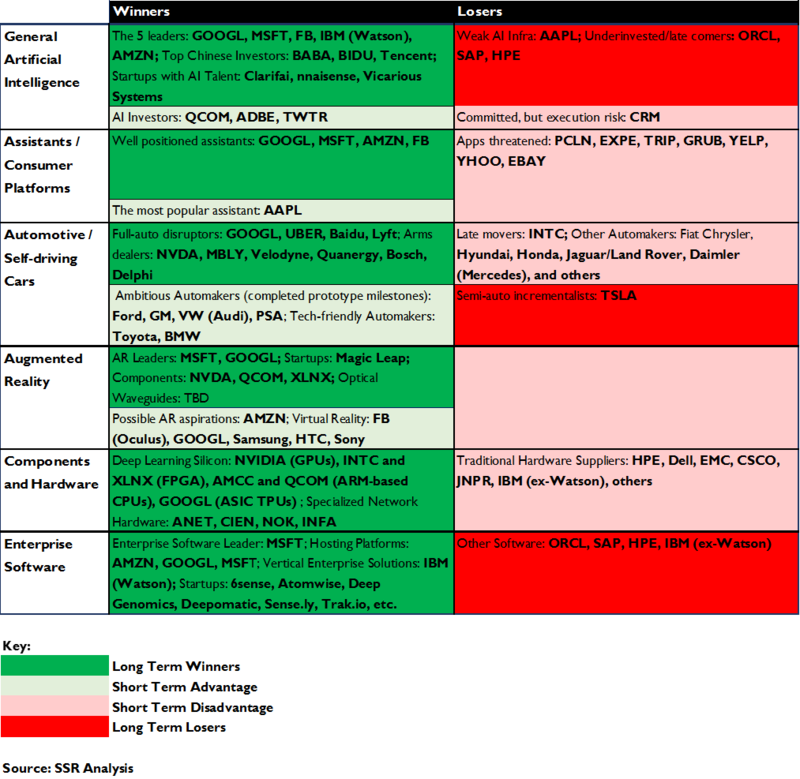 Will AAPL blindside investors? AAPL shares have rallied about 25% over the past 6 months as investors began to anticipate stable revenues with the iPhone 7 and a super-cycle of upgrade demand from the 10th anniversary iPhone 8 at the end of the year. 1QFY17 might show cracks in that sunny narrative. Yesterday, industry analyst CIRP reported the iPhone share of 4Q US smartphone activations dropped from 40% a year ago to 34%. Kantar, which had reported November share gains for AAPL in the US and EU, showed a sharp decline from 25% to 19% in China for the month. All this leaves consensus expectations for 2.2% YoY sales growth tenuous. At some point, investors will look beyond the iPhone 8 to the inevitable hangover from upgrade demand pulled forward. Summary– We see real opportunity in TMT ahead of the earnings season. Like it or not, the Trump election appears to have stimulated new confidence for both consumer and business markets. 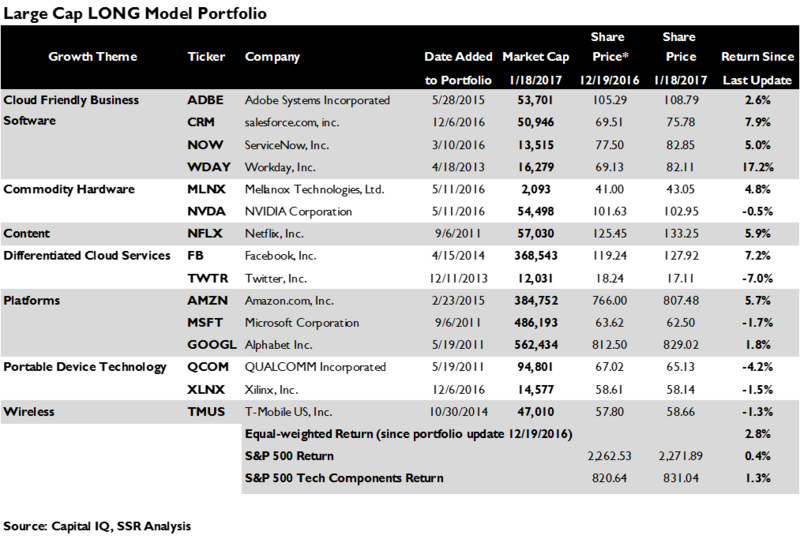 We see the shift to the cloud playing out very strongly here – and look to the FANGs (FB, AMZN, NFLX and GOOGL), SaaS leaders (MSFT, CRM, ADBE, WDAY and NOW), and hyperscale datacenter component suppliers (NVDA, XLNX, and MLNX) to continue leading our model portfolio. We are bearish on linear TV driven media, traditional IT, and the wireless leaders, although we acknowledge that anticipation of an end to net neutrality could buttress VZ, T, CMCSA, CHTR, and others despite structural threats to their businesses.